RT7 is a 19" rack-mount strategic terminal for secure encrypted voice, data modem and position communication services conforming to STANAG, ALE and ARQ standards. 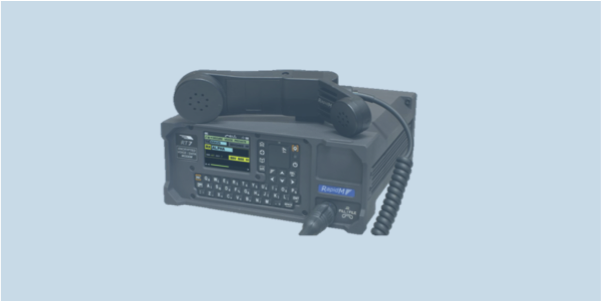 RT7 incorporates RAPTAWC next-generation secure digital voice (SDV) radio speech encryption using new language-independent TWELP low-rate vocoders combined with powerful AES-256 encryption, modulated for HF/VHF/UHF. The Vocoder rate is adapted dynamically to allow optimal quality in all channels. Broadcast and Private-Lines selective call modes are supported, as well as automatic Late Entry. All over-the-air communications, locally stored messages and positions are encrypted. Access to the unit is restricted by means of an Access Code. A Zeroize function is provided from the keypad and CommandPoint which erases all data and keys. RAPTAWC software provides key management for secure key generation and distribution that ensures all over-the-air communications are end-to-end encrypted. System configuration is accomplished with asy-to-use software for rapid creation and distribution of address books, network parameters and device configurations.